With the new furniture finally delivered to your home you are probably looking forward to have it assembled and set up, ready to use. Call the experienced technicians and watch the flat-pack transform into a wardrobe, bed, table, looking as good as it did in the shop. Our professionalism in combination with the years of experience in putting together furniture made by most big retailers, guarantee you will receive quality services. And on top of it all, our flat pack assembly Southgate N21 come at prices that are hard to beat. Simple Assembly provides local people with time and cost-effective flat pack furniture assembly services in Southgate. 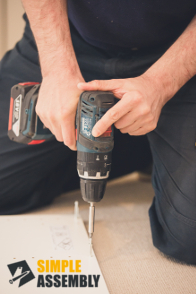 We work with experienced and insured fitters who are fully equipped with the right power tools for the job. We aim at ensuring that your individual requirements are met in the most accommodating and flexible manner. This means that you can book your IKEA furniture assembly at a convenient time for you, 7 days a week. Furthermore, subject to availability, we may be able to provide you with the service at a short notice. For quick and easy booking on Southgate N21 assembly services call 020 3404 5905 now! We have a team of friendly call centre operators expecting your call around the clock to help you define the right service for your needs and to offer you free quotes. And for those of you who'd rather get in touch and make bookings online, use our live chat or online booking form.